We’ve created a simple push notification application to help you get started in our Github repository that uses all of the techniques described below. Download or fork the source code to get started. Push notifications are the little pings your phone gives you to let you know that you’ve got a new message, your friend is waiting for you to take your turn on the latest game or that band you like has just announced a concert in your town. As a developer, push notifications give you a new dimension to engage with your users in real time, any time, regardless as whether they have your app open or even if they have their phone in their hand. Your mobile application securely registers itself with Apple to be able to receive push notifications, usually when the app is being launched the first time. It receives a device token, which the mobile application passes to your mobile backend. 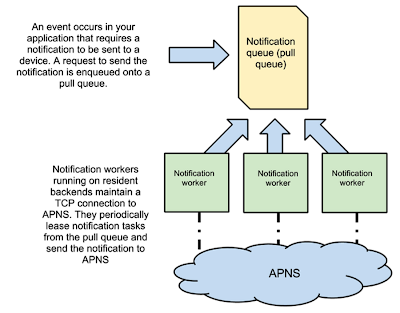 Your server opens a secure connection to APNS, and when an event occurs that requires a push notification - your server sends a short message including the device token of the device that should receive the message to APNS. APNS will then handle the ‘last-mile delivery’ of the notification to the device. Although this seems relatively trivial, there are a few important things to consider when implementing push notifications in your application. If you have a popular application you can quickly end up generating a large number of push notifications - even after a single event. 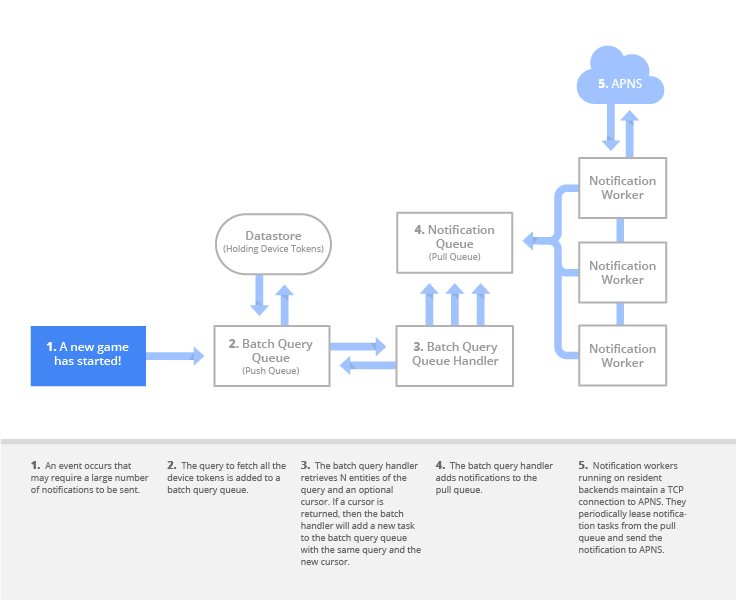 For both performance reasons, and should avoid opening a large number of secure connections to APNS, but rather simply hold a few connections open and funnel any push notifications your applications generate through those. This approach is commonly called Connection Pooling. Fortunately, App Engine provides the building blocks for scalable connection pooling. Resident backend instances are long running App Engine containers that can be used to as workers to hold open APNS notifications for sending notifications. These workers can then monitor a pull queue that can signal to the workers when a notification should be sent. When an event occurs in another component of your application that should trigger a push notification (say an action triggered by your mobile API in a frontend instance), other components of your application can simply enqueue a task on the pull queue. 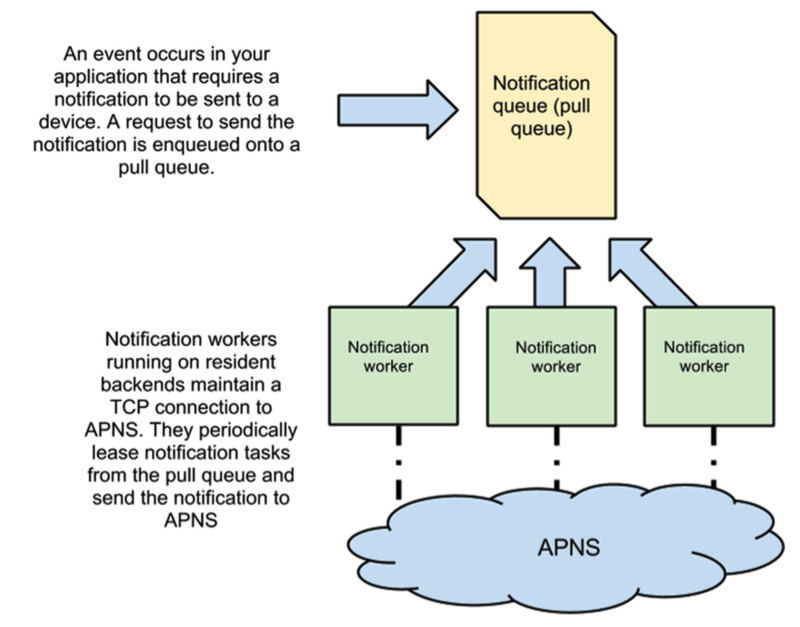 Each worker can then periodically read from a pull queue to see if any notifications need to be sent by the application, and if there are, lease a block of them, send them via the previously established APNS connection, and delete them. As well as saving on opening many connections to APNS, this approach also improves the reliability of the app. If a worker is unable to deliver a message to APNS for some reason (e.g., because the TCP connection was severed), App Engine’s pull queues will release the lease on the task and allow another worker to retry it. You can also scale the solution simply by adding additional workers that read off the same pull queue. You may find a need to send a push notification to a large number of devices at once. This requires a query to your database/datastore to find the list of relevant device tokens and then enqueuing a request onto the pull queue described above that includes the message you want to send along with the relevant device token. If you were to attempt this in a single request, you could quickly run into problems as your list of device IDs becomes large. A simple but elegant solution is to use push queues and (if you’re storing device IDs in the App Engine datastore) query cursors. Query cursors can be combined with App Engine push queues. A push queue handler is written to take a query and an optional cursor. The push queue handler then executes the query with a small result limit (say 100 entities), and for each result adds a task to the pull queue described above. If the result of the query also includes a cursor then this indicates there are still unretrieved entities in the query. Once the task handler has cycled through the results it has retrieved, if it has a new cursor, then it can initiate a new push task with that cursor’s value. While you can use App Engine’s outbound sockets support to talk to APNS from Java or Python directly, popular 3rd party libraries such as JavaPNS also work well, and often provide a cleaner higher level interface for sending notifications. Although this sounds like a lot, putting all of this together on App Engine is remarkably straightforward, requiring only a simple batch query queue handler and notification worker. Everything else is taken care of by App Engine’s robust queueing and datatore APIs. If you’re feeling ready to add Push Notifications to your app, we’ve got some great resources to help you get started. Delivering scalable, reliable mobile push notifications when hundreds of thousands of users have installed your app on their phones can be a major headache. Fortunately, Google App Engine’s support for sockets and accessible but powerful queues makes it easy to quickly build a mobile backend that can reliably scale to huge numbers of devices.